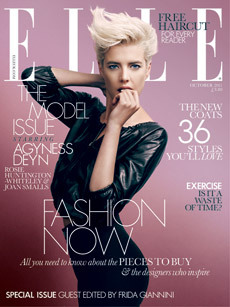 After what has seemed like a bit of a time-out for the bleach blonde super, Agyness Deyn is back gracing the front cover of the UK October edition of Elle Magazine. Slightly reminiscent of Tilda Swinton in this shot, no? Oh my! I can’t wait for my copy to arrive! Loving your blog!